A distinctive feature of Edo culture was the high esteem in which artists working in what we would now consider the "decorative" arts were held. The great artists in tea ceremony ceramics, lacquer, or textiles, for example, were often as renowned as the great painters. 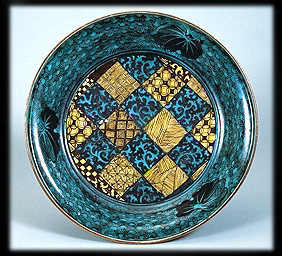 These Kutani dishes, made in the Arita kilns, have a characteristic blue-black, green, purple, and yellow palette. The distinctive colors and patterns are probably based on contemporary textile arts. The creativity of the textile arts was valued in its own time, and the status accorded to that material is illustrated and preserved here in the more enduring medium of ceramics.